Andy Jackson has been featured as a poet and a performer at literary events and arts festivals in Ireland, India, the USA and Australia, including the 2017 Castlemaine State Festival with Each Map of Scars, a collaboration with Rachael Guy and Leonie Van Eyk. Andy's poems have been selected for five of the last six annual editions of The Best Australian Poems. 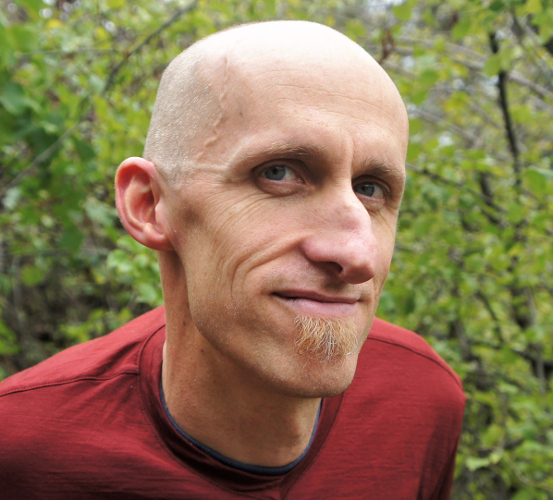 His most recent collection, Music our bodies can't hold (2017), consists of portrait poems of other people with Marfan Syndrome, and was recently featured on ABC Radio National's Earshot. He has worked in call-centers, libraries, and as a creative writing tutor, and is currently undertaking a PhD in poetry and bodily otherness through the University of Adelaide. she will always have the mind of a toddler. A black stork lands outside the kitchen window. her sleeping position. She is fed with a tube. We're careful who we tell about the treatment. Some become flooded with silence and turn away. is the oestrogen therapy to limit her growth. Don't worry, none of this will happen to you. In the bible, an angel will appear in human form. a parent lifting their own forever-small angel. After the surgeries, it seemed her pain was minimal. I look into her eyes and try my best to imagine. and will never understand 'autonomy'. If only we could live forever to care for her.